This mixed-method study examines the interaction between teacher sense of efficacy (TSE) in the use of culturally responsive teaching practices (CRTP). 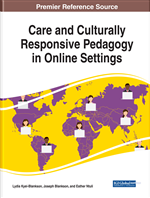 Framework analysis confirms a significant relationship between the affective dimensions of a teacher's sense of efficacy in using the methods of culturally responsive teaching. The achievement orientation of teaching efficacy mediates the use of culturally sensitive teaching practices. Accumulated teaching efficacy in using non-indigenous cultural practices interrupts the fractal interconnectedness of culturally responsive teaching practices. The cultural knowledge from learners of color becomes the “funds of knowledge” (Moll, 1992) necessary for developing culturally responsive teaching. The use of culturally responsive teaching practices positively impacts the achievement of urban learners of color (Driscoll, 2000; Gay, 2002; OECD, 2007; Immordino-Yang, 2007; Schunk, 2012; Office of Special Education Programs, 2013) as evidenced by increased instructional engagement, higher academic attainments, decreased chronic absences, less school dropout (Hammond, Linton, Smink, & Drew, 2007) and reduced disproportionate under-representation in academically advanced coursework (Ladson-Billings, 2013). Despite, research confirming that matching instruction to the culture of urban learners of color makes learning more relevant (Ladson-Billings, 2009) still the practices of culturally responsive teaching remain underused (Siwatu, 2011). This underuse reflects political, symbolic, less responsive, or unresponsive uses of culturally responsive teaching practices, which suggests the so-called “achievement gap” (Ladson-Billings, 2009; Deming, Hastings, Kane & Staiger, 2014) between urban learners of color and their counterparts is the missed opportunity to develop the practices of culturally responsive teaching.